Condo Blues: Have You Tried Shaving Soap? I tried making shaving cream from a tutorial I pinned on Pinterest (give me a follow, pretty please?) and it was an epic fail. The little bit that survived the blender exploding (read about it here if you need a deep belly laugh!) gunked up our razors and didn't rinse out as easy as the full of synthetic ingredient and parabens stuff - because of course again. Little did I know my homemade soap addiction is rubbing off on Husband. (Hey, I'm keeping small businesses in business! At least that's what I tell myself because I'm selfless like that.) I asked Husband if he was interested in trying a soap maker friend's shaving soap. He told me yes, and that we had this conversation before (I don't remember it so it must have been with my doppelganger from a parallel dimension.) Anyway, I bought Husband a shaving soap and brush kit as a gift. I bought mine locally but if you are interested - Father's Day is coming up you know! - it is similar to the shaving brush and soap below. The Escalae 100% Pure Badger Shaving Brush because they say using a badger bristle shaving brush makes a richer soap lather, softens and lifts the beard, open pores, and gently exfoliates. And Husband likes it so there you go. You can get more information about the shaving brush here. Col. Conk Worlds Famous Shaving Soap is paraben free and contains vitamin E and avocado oil and is kind to sensitive skin. Husband likes the bay rum scent. 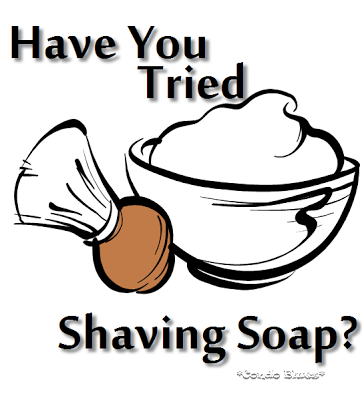 You can get more information about the shaving soap here. I also bought Husband the book Leisureguy's Guide to Gourmet Shaving: Shaving Made Enjoyable so he knew how using a shaving brush and soap differs from what he is used to using and to pamper him a little bit because Husband is wonderful and deserves it. You can get more information about the book here. Husband likes his gift and has already used the small local sample soap I gave him to try out. He just cracked open the Col. Conk's shaving soap and likes it just as much. Our One Small Green Change for May is Husband switching from shaving cream in a can with its synthetic ingredients and (yet recyclable) packaging to shaving soap made from friendlier ingredients and low to no waste packaging. I'm sticking with a low waste electric razor (yes, they make electric razors for women. You can learn more about my electric shaver here.) which makes for a few less things to toss or recycle. Go us! Guys, have you used shaving soap? Ladies, do you think your guy would make the switch?